Spaak, Paul-Henri (English). Continuing Battle: Memoirs of a European, 1936-66. Littlehampton Book Services. ISBN 978-0297993520. 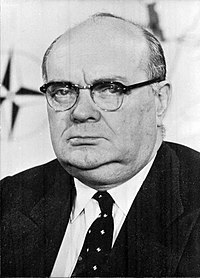 ^ "Profile: Paul-Henri Spaak". The Observer (UK). 13 January 1946. p. 6.